We are Pleased to inform you that visit such a most reliable platform in order to get complete preparation with respect to Urdu subject for educator posts. Here Online mcqs type quiz has been dispatched for NTS written test.By following the below mentioned quiz you can easily take remarkable marks in concerned subject as well.Just attempt the quiz for rehearsal within specific time as designed.After attempting you will automatically the score card on your computer screen. In such a way you can easily assess your capability understanding and knowledge about subject. The Educators Jobs have been announced by the Province wise Punjab KPK Baluchistan & Sindh by their respective departments.The Education Department has assigned such recruitment responsibility to NTS Testing Service Pakistan. Education Department announced its Educators Teachers Jobs Every year. So Candidates face various issues to prepare their NTS test. 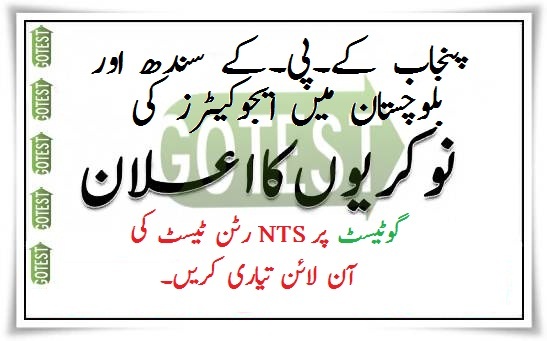 One of the Easiest and best way that is less time consuming and free of cost and major thing is that its on your Door step to preparations online you NTS Test with gotest.pk. Because the gotest.pk is providing you Subject wise and topic wise jobs wise and section wise Entry Test Preparations Online. The Preparations Online NTS Test Urdu Subject with all topics are provided here Below. Because Urdu is Our National Language and its the Compulsory Subject so we should know more about it.